This post is part of the Gluten-Free Ratio Rally, a group of gluten-free bloggers inspired and empowered by Ruhlman‘s Ratio and started by Shauna at Gluten-Free Girl. We get together each month and post many different takes on the same theme. This month that theme is Gluten-Free Shortbread and the rally is being hosted by Meaghan from Wicked Good Vegan. It has been a while since my last contribution to the Ratio Rally, and I can’t be happier to be back. 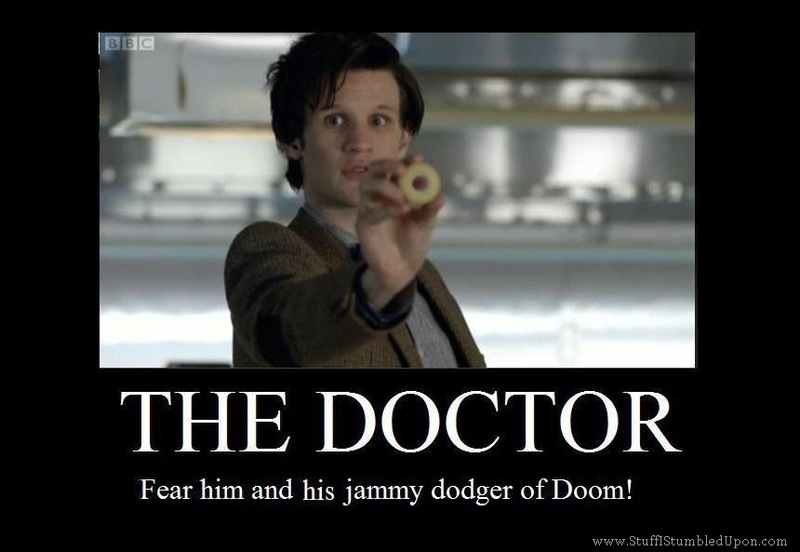 With a pot of coffee, twelve jammie dodgers and a fez. I might be excited because I am letting my nerd flag fly just a little bit. I can’t begin to tell you how long I have been planning to make these – it has been since I found out that the rally this month was for shortbread. Because shortbread meant an excuse to make a gluten-free “jammie dodger”. A british sandwich cookie that has a jam filling. They are buttery, just the right about of crumbly and crunchy. A cookie for a grown up who likes the charm of a sandwich cookie but with the simple sophistication of a shortbread. Ok, and a cookie for your next gluten-free Doctor Who marathon. For those of you who are not as awesomely nerdy as I am, the BBC sci-fi series Doctor Who has featured these cookies as the current incarnation of the Doctor’s favorite cookie, they even stood in for a self destruct button for the Tardis, his time machine/space ship, in one episode. So clearly, I, as a proud nerd, had to make some. Having never had the real ones, and not being to able to ever have them, all I know is that these cookies seem to fit the descriptions of Jammie Dodgers that I could find. A shortbread cookie with a jam filling. You can find the full list of this month’s participants at Wicked Good Vegan. Cream together the butter, sugar, salt and vanilla bean paste until it is just blended. Add the flour in 2 batches, scraping down the sides of your mixer after each addition. Refrigerate the dough for about 30 minutes. About halfway through this time, preheat your oven to 350 degrees. Lightly flour a surface and roll the dough out and cut into 2.5″ circles. On half of them, cut out a small circle or heart. Pop the cut out cookies on cookie sheets into the freezer for 5 minutes before baking. Arrange about a half inch apart on a cookie sheet lined with parchment and bake for 12-15 minutes. Spread the half the cookies with a scant teaspoon of jam and then top with a cookie with a hole cut out of it to make a sandwich. *This recipe will work best with Cup4Cup Gluten-Free All Purpose Flour. You may use Jules Nearly Normal or Better Batter flours with good results. Do not use a baking mix such a Pamela’s or Gluten-Free Bisquick. **Xantham gum only needed if it isn’t in your all-purpose blend, the suggested blends already include it. This post is part of the Gluten-Free Ratio Rally, a group of gluten-free bloggers inspired and empowered by Ruhlman‘s Ratio and started by Shauna at Gluten-Free Girl. We get together each month and post many different takes on the same theme. This month that theme is Gluten-Free Tarts and the rally is being hosted by Heather from Discovering the Extraordinary. Yeast breads make me nervous. Very, very nervous. Most likely because I never made yeasted bread before going gluten-free. I don’t have a lot of experience knowing how the dough or batter should behave. Cakes, I got. Muffins & pancakes? We are good to go. Gluten-free cookies? Just call me an expert. Bread? Well, I am still learning. But I would qualify today’s recipe as a success. Gluten free flours:liquids. Add a splash of oil for flavor. Call it winning. I am serious. This is the easiest yeast bread I have made, and one that has a great flavor. There is an egg in there as part of the liquid, but it also helps beef up the structure and add a wee bit of lift. Yes, this dough is wet. And a little sticky. You just have to trust me. It works. And it is darn good. Brown butter in place of the traditional olive oil. Sage on top. A sprinkling of sea salt. The yeasty flavor that you only get from home made or artisan loaves. This is some seriously delicious bread. Want a different flavor? Use good olive oil in place of the browned butter. Swap out the toppings. Mix something into the dough. Preheat your oven to 150 degrees. Turn it off once it is warm. Line a 9×13 baking dish with parchment paper and grease well with olive oil or butter. In the bowl of a stand mixer, combine the warm water, yeast and sugar. Melt butter over medium-low heat and continue to cook until it turns brown and starts to smell slightly nutty. Be careful not to burn the butter. Let cool slightly. Add the egg and browned butter to the bowl of the stand mixer, and mix until just combined. Stir in the flour, salt and xantham gum (if using). Mix on a low speed for 3 minutes. You will have a slightly shaggy and tacky dough. Spread the dough into the baking dish with a spatula, trying to make it even. Cover the pan with a towel and place in the oven for 45 minutes. Remove from the oven, and heat the oven to 425 degrees Fahrenheit. Sprinkle the dough with the sage and sea salt. Put the pan in the oven, then drop the temperature to 375 degrees. Bake for 35-40 minutes, or until golden brown and hollow sounding when tapped. This post is part of the Gluten-Free Ratio Rally, a group of gluten-free bloggers inspired and empowered by Ruhlman‘s Ratio and started by Shauna at Gluten-Free Girl. We get together each month and post many different takes on the same theme. This month that theme is Gluten-Free Tarts and the rally is being hosted by Adina from Gluten Free Travelette. This post is brought to you by the number 1. Since Big Bird isn’t at risk of getting fired, I thought a Sesame Street reference would be OK.
And the ratio is full of them, so there is that. And heck, throw in some liquid (up to 1 part) for good measure. I mean, that is where pound cake got its name. A pound of butter, a pound of eggs, a pound of sugar and a pound of flour. Equal parts. Awesomely delicious. Now, put that in a bundt and you have a winner. I don’t want to get too crazy into the science here, but you can vary any of these ingredients by up to 20% and your ratio should still work. I added liquid, cut back a little on the sugar and added a little extra flour so that there was an even cup measurement for those of you who still bake by volume (someday you will see the light, I just know it). I also cut back on the butter and eggs, to make room for the liquid. (How the flavors got into the cake). Ok, I just had to. Mostly because Bundts are awesome. They are usually a dense cake, like a pound cake, baked in a pretty pan and topped with a glaze. Easy peasy. How about a scene from a romantic comedy about bundts? Chai is one of my favorite things. I drink double dirty soy chai lattes. My first recipe on this blog was for Gluten Free Chai Latte Cupcakes. In my first Ratio Rally, I shared a recipe for chai gluten-free cream puffs. And it is back again. Chai spiced vanilla bean bundt cakes. In minature. Bundts are elegant and un-fussy, and can be whipped up in a jiffy. They are even a breeze to decorate. Excellent for a last minute birthday treat. This month’s rally is over at GFTravelette – make sure you go check it out! In a small sauce pan over low heat, simmer the milk, cardamom pods, star anise, cloves and fresh ginger for 20 minutes. Remove from heat and set aside to cool for a few minutes while you prepare your miss en place. Preheat the oven to 350 degrees and grease your mini bunt pan. Whisk together the flour, xantham gum (if using), baking soda, baking powder and salt in a medium bowl and set aside. Cream together the butter and sugar until light and fluffy, using a stand mixer on medium-high and beating for about 5 minutes. Add the vanilla bean paste. Beat in the eggs one at a time, scraping down the sides after each addition. Strain the steeped milk, and add 1/3 to the batter. When it is fully incorporated, add half the flour, and scrape down the sides of the mixer. Repeat until you are out of milk and flour (it should go milk – flour- milk -flour – milk). Mixing on no higher than medium, and scraping down the sides after each addition. Use a #40 scoop (or fill the wells of the pan no more than half way), and divide the batter into the pan. Bake for 20 minutes, until the cakes are golden brown and a tooth pick inserted into the center comes out clean. Cool on a wire rack. While the cakes are baking, split the vanilla bean and scrape the seeds into the 3 tablespoons of milk in a liquid measuring cup or a bowl with a spout. You want this to sit for 20-30 mins. When the cakes are done and cooling, whisk the powdered sugar and salt into the vanilla milk. You want a glaze that is thick and opaque, but not so thick it won’t pour. If it is too thin, it will run off the cakes. My advice? Have a test cake and when you think you are close drizzle a little and see how it works. If the glaze gets too thick, add a half a teaspoon of vanilla extract. Serve in cupcake papers for a pretty, special treat. This post is part of the Gluten-Free Ratio Rally, a group of gluten-free bloggers inspired and empowered by Ruhlman‘s Ratio and started by Shauna at Gluten-Free Girl. We get together each month and post many different takes on the same theme. This month that theme is Gluten-Free Tarts and the rally is being hosted by Charissa from Zest Bakery. Frankly, I want chocolate. I want chocolate dipped in chocolate with melted chocolate and caramel on top. I have been having a rough go of things over the past few weeks. I’ve been swamped at work. My plan to spice up my life has worked a little too well, and I feel a little thrown. My leg started turning purple again – and the color being normal was the only real progress that had been made since this all started. I went to the dentist. <- that right there is reason enough to live on chocolate for a month. But, when you want to eat your feelings, it is best not to. I still wanted something comforting. And fall-y. (Yes, that is a word now). Orange food means fall, right? And since it is starting to get chilly in the mornings and evenings, i thought some nice cheese would help warm me up. There you have it, orange + cheese + pie crust = parmesan sweet potato tart. Is still pretty close to 3 parts flour, 2 parts fat and 1 part liquid. The fats and liquids are just redistributed a little bit. There is an egg yolk for fat, but also to act as a binding agent and a little bit of the liquid. Then there is the buttermilk, which (please don’t ever buy low fat buttermilk for baking unless it is specifically called for) adds fat & liquid to the mix. I learned this trick from Lena over at Cup4Cup – it makes a dang tasty pie crust. I think it beats my old vodka trick. Pulse it all in a food processor. Let it rest for 30 minutes or so, this re-chills your ingredients and makes the dough easier to handle. This tart will fit into a 9″ round perfectly. If you want to use a rectangular tart like pictured, you will end up with a wee bit extra filling. Use the extra crust and filling to make a mini tart or two in a ramekin. Cut the butter into fourths and place in a food processor. Add the flour, sugar and salt. Pulse until you have a mixture that is the texture of wet sand. Add the egg yolk & butter milk. Pulse until just combined. Gather the dough up, press it into a disc about 4″ in diameter. Wrap it in plastic and place it in the refrigerator. You can do this up to 24 hours before you want to make the tart. Line a rimmed baking sheet with parchment paper & preheat the oven to 350 degrees Fahrenheit. Lay them out flat and drizzle with olive oil, and sprinkle with thyme, salt and pepper. It is important that you don’t skip seasoning the potatoes. Bake them for 15-20 minutes. You want them to just be softening. In a small bowl, lightly beat the egg and cream together. Raise the oven temperature to 375 degrees Fahrenheit, and place a clean baking sheet on the middle rack of the oven. Take the dough out of the freezer, and on a well floured surface, roll it out to be 2″ wider and longer than your tart pan. Gently lift the dough and pace it into the tart pan. Press the dough into the edges and fix any tears with extra dough. Line the bottom of the tart pan with sweet potato slices and top with 1/4 of the parmesan cheese and then 1/4 of the sage. Repeat 2-3 more times (until you run out of potatoes). Slowly and carefully pour the egg and cream mixture over the potatoes and cheese. Be patient, it has to seep all around your potatoes to fill in all the air pockets. Top with any remaining parmesan and sage. Place the tart pan on top of the hot baking sheet in the oven. Bake for 40-45mins. When the crust is lightly browned and the cheese is golden and bubbly, your tart is done. Let cool for 10 minutes before removing the tart from the pan to allow the filling to set up. *Frankly, I think Cup4Cup works the best of any of the blends you can currently purchase. Jules Nearly Normal and Better Batter are suitable alternates if you can’t have dairy or can’t find the Cup4Cup in your area. This post is part of the Gluten-Free Ratio Rally, a group of gluten-free bloggers inspired and empowered by Ruhlman‘s Ratio and started by Shauna at Gluten-Free Girl. We get together each month and post many different takes on the same theme. This month that theme is Gluten-Free Angel Food Cake and the rally is being hosted by Caleigh from Gluten Free[k]. Today is about finding and celebrating joy. Because it is here. In every day. Even when it hurts to put on real pants. And some days, I need to remind myself of it. Joy is seeing art exhibits and taking tours in French of the Art Institute with my aunt. Joy is my cat telling me it is time to go to bed by sitting on my chest so I can no longer see the computer screen. And then refusing to move until i go to sleep. Joy is how I feel when I step of the train in the Loop and the promise of a good day is hanging in the air. Joy is a hug sent via email from a friend on the opposite side of the world. And a phone call from that same friend at exactly the wrong time because someone can’t do math. This is what I am focusing on today. And sometimes, all you need is a little cake to bring it to you. 3 parts egg whites: 3 parts sugar: 1 part flour (the lighter the better). Not going to lie, I love angel food cake. And there is a recipe that we have used often in our house – one that is gluten free just because it is. The one from the back of the Swan’s Down Potato Starch. It is quite lovely, and it means, dear readers, that this is a fairly flexible cake. Add cocoa or ground chocolate in place of some of the flour for a chocolate cake. Use potato starch or arrowroot because that is what you happen to have. You will still end up with a magical, light cake. Well, as long as you resist the urge to brush the warm cake with the earl grey syrup. Because I did not. And I melted my cake. And I know better. At least it still tastes good. Rainier cherries pan roasted with cointreau. Earl grey syrup. Orange extract in the cake. I would say, dear friends, that this is one sophisticated cake. The cointreau and the orange extract in the cake help pull the bergamot flavors to the forefront in the tea syrup. The tea itself gives a complex background for the oh-so-sweet cherries. I whole heartedly suggest that you try the cake with all of these components. Sure, the cake on its own with fresh berries and home made whipped cream would be a perfectly simple dessert. But this my friends, is a rockstar dessert. This is not your mom’s tired angel food cake. This is not the Styrofoam textured cake that you can buy at the grocery store (yes, the filled with gluten kind). This is a melt-in-your-mouth cake. A curl your toes with delight cake. This is the cake you want to make when you are trying to impress someone with your mad skills but can’t pipe frosting for the life of you. Or if you think you aren’t an accomplished baker. Make just the cake, or make it with all the components. Either way you will have an excellent cake. Steep the tea in the boiling water and let sit while you make the batter. Preheat oven to 350 degrees fahrenheit. Whisk together the flour and half the sugar, set aside. In the bowl of a stand mixer, whip the egg whites until foamy, about a minute. Add the the remaining sugar, cream of tartar, lemon juice, salt, vanilla and orange extract to the egg whites. Increase the speed to medium-high, and beat until soft peaks form. Now is the time that requires a little patience, fold in the flour/sugar combo 1/3 at a time. You want to make sure that you do not deflate the mixture too much. Pour batter into a 9 or 10″ tube pan and bake for 30-50 mins. You want a tester inserted into the middle of the cake to come out clean. Remove the teabags from the tea. In a small saucepan over medium heat, bring the strong tea and sugar to a boil. Let boil for 5 minutes (you want to end up with about a cup of syrup. While the cake is baking, and the syrup is cooking (you do not need to stir it), combine cherries, half the cointreau, the sugar and the salt in a large skillet. Cook over medium heat until the cherries start to soften. Pour in the remaining cointreau to deglaze the pan and keep cooking until the sauce thickens back up. Stop cooking before the cherries turn to mush. Let the cake cool in the pan on a wire rack for an hour and a half. Resist the urge to brush it with the syrup until it is cool. When cool, poke some holes in the bottom of the cake and brush with the syrup. Remove cake from pan, poke the top with holes and brush with syrup again. Top with cherries and serve. Amaze your friends. *If you want to use potato starch or arrowroot, please go by weight and not by volume. You will end up with a little more volume wise. **If you just want a plain cake, skip the orange extract and replace it with vanilla. This post is part of the Gluten-Free Ratio Rally, a group of gluten-free bloggers inspired and empowered by Ruhlman‘s Ratio. We get together each month and post many different takes on the same theme. This month that theme is Gluten-Free Crackers and the rally is being hosted by Rachel from The Crispy Cook. This is a post about crackers. Which happen to be another something I don’t care too much for the commercially available options, and I always thought that baking them was incredibly labor intensive. I cannot believe that it is May, much less that it isMay 2nd and that it is Ratio Rally day. Because April was one ca-razy busy month. There was a blogging conference and a gluten-free expo. There was a gluten-free cookie ebook to write. There were high school musicals and there was a design conference and a pastry demo at the French Pastry School. I am not sure how I got so much done in a month! All I know is that I am beat. And it is Ratio Rally day. And I am hoping and praying that these “bagel bombs” turn out swell. The Gluten-Free Ratio Rally is a gluten-free blog event started by Shauna of Gluten-Free Girl. Each month a group of food bloggers gets together and bakes a gluten-free treat by starting with a basic ratio (that stands in traditional baking) and using that ratio as a starting point to create their own baked masterpieces. All of my contributions to the rally can be found here. You can follow the rally on twitter with the hashtag #gfreerally.